For the past six years, our assessment of the State of Working Iowa has been shaped by background conditions of the Great Recession and the not-so-great recovery. Iowa was spared the brunt of the recession — which fell hardest on states that were more vulnerable to a housing crash (Florida, Arizona), or those that were more vulnerable to the collapse in consumer demand that followed (Michigan, Ohio). But Iowans have experienced many of the same economic pressures — including a slow jobs recovery and stagnant wages. We also have experienced many of the same political pressures, including attacks on the public sector, shortsighted austerity budgeting, and a race-to-the-bottom scramble to cut business costs. In Iowa and the nation, the recession exaggerated a drift toward diminished employment security and widening inequality. And, in Iowa and the nation, the recovery has offered little respite. 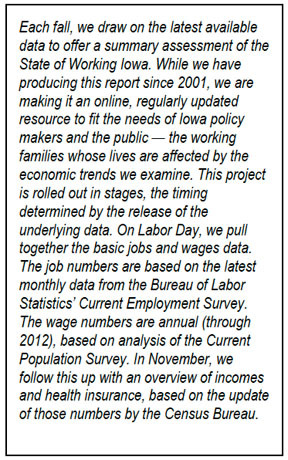 In this online version of The State of Working Iowa 2012, most of the graphics that accompany our analysis have interactive elements or menus that allow readers to engage in their own investigations or comparisons — toggling between the Iowa and national numbers on key measures, for example, or choosing the points of comparison. Text in the print version of this report may differ in minor respects from this version in references to graphics, due to the difference in print graphics from interactive graphics.